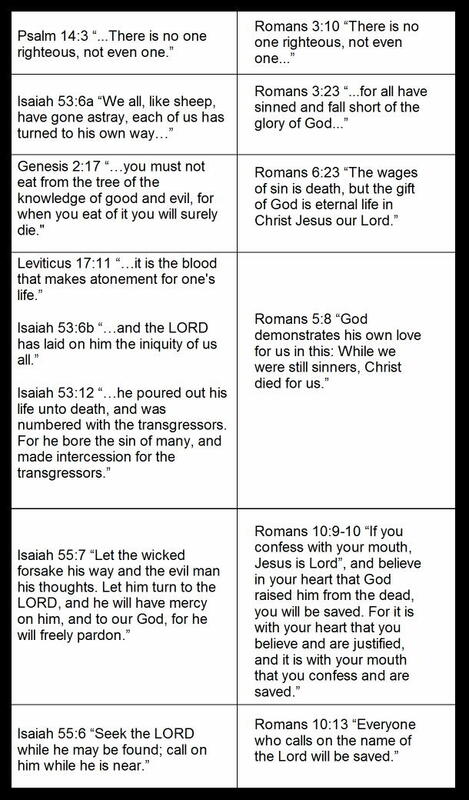 Let us look now at one evangelistic tool known as the Roman Road (below, right), and compare those verses found in the New Testament to what the Older Testament (below, left) has to say concerning our sin and God's salvation-solution for humankind. These verses show us that our good works are not enough—no one is righteous. In fact, Isaiah 64:6 says our good works are like filthy rags! We cannot be forgiven of our sins without a sacrifice—it is the blood that makes atonement for one's life, Leviticus proclaims, and is echoed in Hebrews 9:22, ". . . without the shedding of blood there is no forgiveness." We need atonement, that is, "at-one-ment" with God; we need to be made right, our sin-debt requires payment. It must be satisfied, either by our individual deaths, or the death of a substitute, someone to take our place—his name is Jesus—"he will save his people from their sins" Matthew 1:21. Our sin-problem requires divine intervention. The prophet Isaiah declared, ". . . he bore the sin of many and made intercession for the transgressors." And the Apostle Paul in his letter to the Romans said, ". . . while we were still sinners, Christ died for us." God provided the solution, even before we committed our first sin! This gospel message, this good news, is for all those who call on him, who trust in Jesus' atoning work on the cross. God's forgiven people are then commanded to go and tell others, "Go into all the world and preach the good news to all creation" (Mark 16:15), an echo of Isaiah 52:7, "How beautiful on the mountains are the feet of those who bring good news, who proclaim peace, who bring good tidings, who proclaim salvation." From Genesis to Revelation, the Good News message of the Bible is one story of redemption; it is an inclusive message of God's love and salvation for all people. Prayer: "Father God, Help me to proclaim your good news today. Help me to be a peacemaker, holding out the Word of Truth to those I encounter. Amen." Copyright 2009 S.A. Keith - All Rights Reserved. Your donation to the site helps to distribute our children's ministry resources to churches across the world.